These were the words my inspiring yoga teacher Lindsey Park whispered to me before we arrived in Spain to embark on a life-changing yoga retreat at the beginning of November. 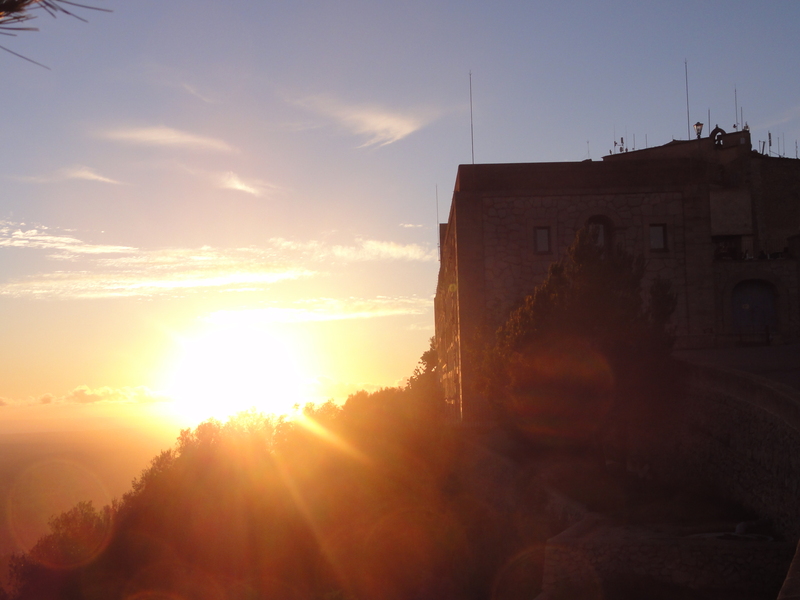 I have just returned from Spain last night, and am still riding a high after experiencing an unforgettable week of yoga, meditation and clarity inside the 13th century Catholic Monastery atop Sant Salvador in Mallorca. I shared this incredible journey with six of the most amazing and beautiful souls: Lindsey, Paula, Kelly, Yvonne, Amber and Sandi. I profess I did not know what Lindsey meant by these words, but I did have a feeling – an assumption one could say – I was going to experience something in Spain that would have very profound implications for my yoga practice. Lindsey was right, and I did not labor under any false assumptions. But what exactly was I ready for? In my mind, after 16 months of arriving in this practice, I was ready to go to the monastery in Spain to gain knowledge about the philosophy and theory of yoga, and to deepen my physical practice with fellow yogis of like mind and spirit. I had no idea that during our eight days in Mallorca I would become tested – in my body and in my mind – to see how far I could push my physical, emotional, and psychological limits. 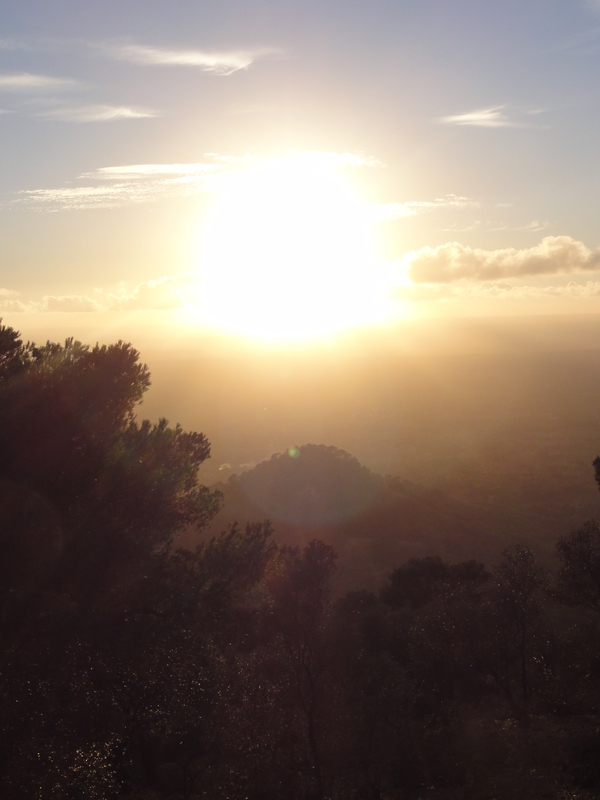 On my journey over the last few weeks in Sant Salvador, Spain, I have experienced an awakening – an arrival if you will – to certain truths that will serve me as I move forward in life. Sometimes, these truths are hard truths, and that is a lesson in itself worth memorializing. What is most precious though is that I learned each of these valuable life lessons with the able and compassionate guidance of all of my fellow yogis. The monastery itself was absolutely magnificent in its power and beauty. It sits at 510m atop Sant Salvador near the town of Felanitx (at least I think it’s the size of a town!) in Mallorca. We were given a guided tour of the church that still stands today inside the walls of the monastery. The custodian of the Monastery explained to us that during the time of the Black Plague in Europe, a group of monks selected this site to build the monastery as a place for prayer to escape the Plague. We were pleased to have been invited as the only group staying at the monastery for the week thanks to our amazing co-instructor, Paula (pictured with me, below, on our way up to the top of the monastery on Day 1). Here are just some of the very first pictures I took of our hotel room and surrounding views on Day 1. 1. We are more than what we think our physical body can endure. Upon a firm foundation, our potentiality is limitless. As this was my first yoga retreat, I did not know how much yoga I would be actually be doing on a daily basis. One of the very first things we did was set an intention for the week, and to honour that intention by lighting a candle and placing it on the altar inside our yoga practice room. We would return at the end of the week to blow out our candle, and to re-visit our intention to see if it had changed, or remained the same. We learned very quickly on Day 2 to adapt ourselves to a usual morning Ashtanga or Vinyasa flow class (usually at 7:30 a.m.) after a Pranayama (control of breath) session involving Kapalbathi (rapid inhale and exhale) and Nadi Shodhan (nose cleansing) breath work. After lunch (which was always catered for our group), we usually had the afternoon to relax on our own for a few hours (I usually ended up reading, lounging on the balcony to soak up the sun, or go for a run/hike around the monastery grounds). On the weekend, we attended the local market in Felanitx (pictured below) where we fell in love with the locally recommended tapas restaurant and idyllic surroundings. In the afternoon, we would usually attend one group yoga session around 3:30 or 4pm before dinner (each dinner again was prepared by the amazing hotel staff just for our group, pictured below) and then a late evening yoga nidra (or guided “yogic sleep”) session around 8:30 or 9pm before heading off to bed. Each of the asana yoga sessions was led by one of our co-instructors, Lindsey Park or Paula Cava (who is a local Mallorcan from Palma!). But, Lindsey led us through all of the yoga nidra sessions (which I found incredibly illuminating and yearning afterwards to learn more about this branch of yoga). Both Paula and Lindsey pushed me daily to venture deeper into the physical limits of my practice. In particular, Lindsey gave hands on adjustments to me almost daily, at one point I managed to “float” from downward do g position into a standing forward fold position. This was a huge revelation for me. I didn’t think I could ever get to the point of floating in between transitions. She said to me that this transition would change my practice. She was right. Since that day, I’ve been incorporating this floating transition into my practice. And that’s just the start of where I can take this practice into the future. I had been working with Ujjayi breath in my regular yoga practice for at least a few months before heading to Spain, but I did not truly appreciate the capacity of Ujjayi to sustain one’s focus in the present moment until I took Paula’s Ashtanga class. In a word, it was intense. But, with a focus on sustaining my Ujjayi breath, I have really come to love the Ashtanga style of yoga. I am committed to trying out a few Ashtanga classes at True Yoga in Edmonton to see whether I wish to deepen my practice in this field of yoga. I also came to experience an intense and deeply empowering breath technique known as “Wim Hof” named after its Dutch founder, Wim Hof. Hof is known for his world-record setting time for the longest ice-bath, as well as for his ability to climb 6.7 km up Mount Everest while wearing nothing but his shorts and shoes. He credits his ability to withstand extreme cold temperatures to his breathing. The Wim Hof method, as it is known, is focused on oxygenating the body to its optimum through constant inhalations and exhalations followed by holding one’s breath on the exhale for as long as the body can tolerate. I must say, I was skeptical at first of trying out this breathing technique, but I have found it another useful tool in expanding my overall breath work in yoga. One other thing I did to test my physical limits: stand up paddle-board yoga! When Paula said “Alex, you go!”, I was not impressed. I am generally not an open water person (after having a scare in the Great Barrier Reef in 2006), but as it turns out, this was so much fun! I realized that my fear of open water was always just in my head. Once I got on that paddle-board and paddled out into the calm Mediterranean sea, I was fixated on nailing my balance so I could try to pull off some cool yogi moves. I managed to get into malasana (yogi squat, pictured left) and downward facing dog (pictured below right), but it is clear I still need more balance to pull off more advanced po ses. And not falling in the water is also a good thing! I suppose one could say that in the last few weeks, I’ve really pushed my limits physically and stepped out of my comfort zone to try new things that normally I would prematurely avoid or pre-judge. 2. We must love ourselves before we can truly love others around us. This means we must forgive ourselves in an honest way before we can forgive others. This is vital to establishing balance in our subtle body or “chakras”. For many of my fellow yogis, including me, the room was filled with an overwhelming energy of our collective consciousness. Many of us were brought to tears with the experiences that we went through that evening. Everyone recognized that while we were all on our own personal journeys in Spain, the universe brought us all together in Spain for a reason: to teach each other about the cathartic experience of being. My friends Kelly and Sandi described for example how they felt the physical heat emanating from my body feed into their own energy field, which, in turn, enhanced their own very intimate and personal experiences of forgiveness and reconciliation. Indeed, for two days during the retreat, I kept hearing people say to me how my third chakra was “on fire!”. I literally had a red “belt” of sunburn across my solar plexus and abdomen, directly in the area of my Manipura (also known as the third chakra which is the chakra responsible for self-esteem, willpower, self-discipline, and the power of transformation). Then, the “fire” around my solar plexus disappeared. What did this experience teach me? Lindsey explained to me – and I believe her – that in my life, I have always had a strong focus on self-discipline, organization, and the power of transformation (for a positive purpose). I suspect most lawyers have a strong third chakra. But, from the perspective of the chakra system (in brief, a chakra is the Sanskrit word for a meeting point of the subtle (non-physical) energy channels in the body called nadi) Lindsey expressed to me that there are other aspects of my life – other chakras – which have suffered deficiencies as a result of my sustained focus on my Manipura chakra. This meant that I needed to focus my attention more on bringing my second chakra or Swadhistana (namely the second chakra responsible for love, pleasure and passion) into balance with my other chakras. 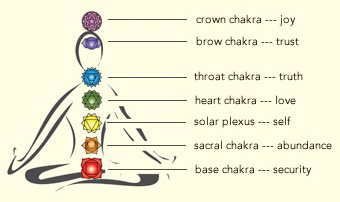 The result of this would be to restore all of my seven chakras into equilibrium. Now, you may not believe a word I say about the chakra system which is fine, but speaking only for myself, the language of the chakra system has fundamentally changed my experience of yoga. To me, this language about the flow of energy channels in the subtle body has brought my understanding of yoga “full circle”. It is not unlike the concept of “chi” energy in Tai Chi or traditional Chinese medicine. I look forward to expanding my knowledge of the chakra system as I move forward with my yoga practice and practice of mindful living. I cannot thank Lindsey enough for her wisdom, compassion and guidance as my yoga teacher and friend in life. She has imparted so much knowledge to me about the practice of yoga and its application to all facets of my life. I am a better human being because of Lindsey’s example. She is quite simply an amazing person and a shining light in my life. 3. We have the mental power and strength to overcome any adversity in our lives. But, it is up to us to live this intention – to make the choice to exercise and harness this power. I could give numerous examples of people who represent the essence of this principle. But, two people I am thinking of the most as I write this are my friends Amber (pictured in the photo on the left, middle) and Sandi. Amber came to Spain for a specific personal reason after dealing with significant adversity in her life (which I will not disclose here). She is the loving mother of two precious boys, and also wife to a loving partner. She made the conscious choice to leave her boys in the custodial hands of her partner in order for her to focus on herself and to continue growing in her yoga journey. I cannot tell you how much respect I have for her. She not only made great strides in her physical asana practice, but she brought so much joy and warmth to our group. The experience would just not have been the same without Amber. The second person I am thinking of in this moment is Sandi. Sandi came to Spain on an impulse (much like me). She expressed in class that she saw the ad one day at the yoga studio and knew she had to come to this retreat. I quickly learned that Sandi is a person of who exudes positivity and a zest for life. She is the type of person who will try anything once, and also is a person who stands by her convictions. During one of our yoga nidra sessions with Lindsey, Sandi described how she was brought to tears, but could not tell us about her experience until the morning. I was floored by her story, as were my fellow yogis. Although I will not disclose what she said to us here, I can confidently say that I have grown to develop a tremendous amount of respect for Sandi over these last few weeks. I could tell that her smile got bigger and brighter after she told us her story that morning. It was as if a giant weight was lifted off of her shoulders. 4. We must always strive to live in the present moment. We must spread compassion, not hate; and we must promote peace, not conflict. This next lesson was best exemplified by two of my yogi friends: Kelly and Yvonne. Beginning with Kelly, my yogi brother, truth be told I was not even sure at first whether we’d get along in Spain. I thought we might. I had only met Kelly briefly in Edmonton before we arrived in Mallorca. As it turns out, Kelly and I were roommates and became very good friends and brothers during our time in Spain. Kelly has taught me so much about the power of compassion and unconditional love for our fellow man. He sees the good in everything and everyone. He is someone of great personal integrity; someone who exemplifies humility in all things. Kelly has helped me to deepen my yoga practice by his dedication to his own practice and desire to expand his knowledge in the theory and practice of yoga. I would be honoured to place my yoga mat next to his any day. My hope is that one day he and I as yogi brothers will complete our Yoga Teacher Training together with Lindsey as our fearless leader. I must also say a word about my friend Yvonne. Yvonne is originally from Tanzania but currently resides in London, England. From the first day I met her, I knew Yvonne was a person who has lived a full and abundant life. She has an infectious zest for life and a child-like curiosity that inspired everyone around her. Yvonne taught us about the power of living in the present moment with absolutely no regrets. I can still recall Yvonne venturing out on the paddle-board with her headphones on and taking in the experience as if nothing else mattered in that moment. This is indeed a precious memory that I will carry with me the rest of my life. Thank you, Sant Salvador. Until we meet again. There is no doubt I have returned to Canada a changed human being. Travel in general forces a person to step outside of their comfort zone to try new things. Sometimes with good, bad, or mixed results. But, I honestly can say I have no regrets in making the decision to go to Spain. I felt at home in the mountains of Mallorca, surrounded by an idyllic landscape and some of the most inspiring and compassionate individuals I have ever met. The wonderful memories I shared with these beautiful souls I shall carry with me the rest of my life. Thank you Lindsey, Paula, Kelly, Sandi, Amber and Yvonne from the bottom of my heart. I know one day I will return to Spain to start another chapter in my journey in mindfulness and yoga. But for now, I reside in a feeling of genuine gratitude for all who have blessed my life with their example, their energy, their compassion, and their love. Always remember you are already perfect the way you are. You are a wonder of life and a light to the world. I am ready. I am ready in body, mind and spirit for all that life has in store for me. Such profound truths. I am glad your trip to Spain brought you so many blessings of awareness and understanding. What an amazing experience! God bless! And to you, as well, Alex. May the year ahead of you be filled with light and abundant blessings!